It was an entertaining start to the match from both sides. The ball had been back and forth in both forward 50s. Pressure in the match was red hot with both teams playing well. A big hit was placed on Emma Kearney in the fierce first term. Ash Riddell played a great first quarter, she was everywhere. Each time Kearney was near the ball she was unable to break away as Carlton’s Jess Edwards tagged her. Both sides had opportunities early but unable to capitalise. Riddell kicked well towards Emma King and Kirby Carlton gives away a free kick to King. King slotted through the historic first goal for North Melbourne Tasmanian Kangaroos. North Melbourne teammates come from all over the ground to celebrate the memorable moment. Debutant Jess Edwards booted through Carlton’s first goal of AFLW 3.0 from a snap kick set up nicely from Maddie Prespakis. At quarter time North Melbourne held a narrow lead of two points over Carlton. North Melbourne Tasmanian Kangaroos were dominant in the second quarter. Jasmine Garner kicked cleverly to Ash Riddell who has played a superb first half of footy with 10 disposals. Riddell kicked truly for North’s Melbourne’s second goal. North Melbourne was a class above Carlton, as they scored three goals and kept Carlton scoreless. Former US College basketball Alison Drennan from the goal square snap kicked through the goal for North Melbourne. Carlton had no answers to North and thatpressure provided North with a free kick to Jasmine Garner who kicked a minor score. Riddell kicked to Mo Hope who marked strongly and Hope kicked her first goal as a North Melbourne player. Hope looked incredibly happy and strong for North Melbourne up forward in the second quarter. At the main break North Melbourne had an advantage of 24 points over Carlton. The big three for North Hope, King and Garner took over in the third quarter in what was a dominant quarter for North Melbourne outscoring Carlton two goals to one. 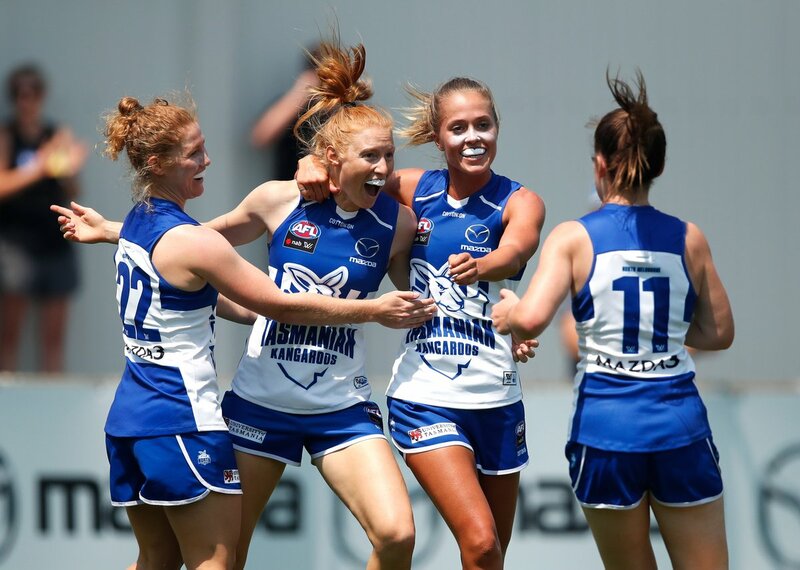 King continued her dominance in the ruck and up forward for North Melbourne, as she marked strongly and kicked her second goal for her new club. North Melbourne was relentless with their hard pressure all over the ground especially in their forward 50. Darcy Vescio set up Carlton’s only goal of the third quarter as she kicked the ball to Bri Davey who took a diving mark much to the dismay of Britt Gibson who gave away a 50. Davey slotted through the goal from the goal square. Madison Prespakis played well all match and her young talent was on full display. Riddell announced herself to the rest of the competition as a strong unrelenting midfielder. Garner topped off an incredible match for North Melbourne with a goal from a strong intercept mark. Carlton were down by 31 points at three quarter time. North Melbourne continued their dominance in the final stanza and it was led by Riddell who finished with 16 disposals, 4 tackles, 5 inside 50s, a goal and 2 goals assists. It was an impressive game from Riddell. Her North Melbourne teammates in Jenna Bruton, Duffin and Garner also complemented her well, as they all finished with 17 disposals each. 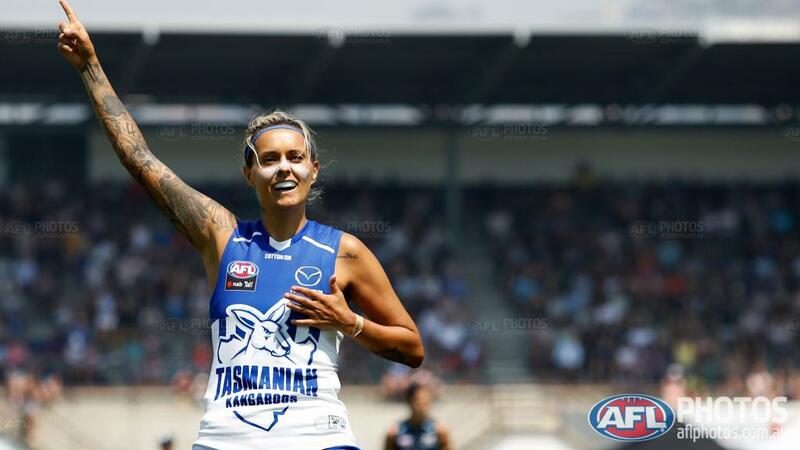 King was dangerous with 7 tackles in the ruck and Kearney finished with 18 disposals and five tackles a sensational game by North Melbourne’s captain and stalwart of the AFLW for North Melbourne too. Proud Tasmanian Brittany Gibson nailed through a long bomb goal at home in Tasmania and it was reward for all her efforts down back with her ferocious tackling. North Melbourne showcased how polished, skilled and determined as a side they were this afternoon. Historic day made even better for the North Melbourne star-studded lineup in front of their Tasmanian faithful’s they pulled off a dominant win by 36 points at their home.